No, not me. I had mine when I was 6. 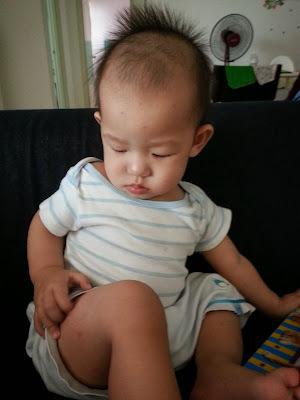 It's G. G got the pox from his elder brother who had it about 3 weeks ago. Then 3 weeks after, it's now G's turn. The pox virus incubated in him for about 3 weeks before they finally decided to pop out. So please don't be too happy (yet) to see the other sibling not encountered with the pox after the one with chicken pox recovers after 3 weeks. The other sibling might have the pox after everything seems to be fine. The chicken pox vaccination is given to babies usually on the 13th month. 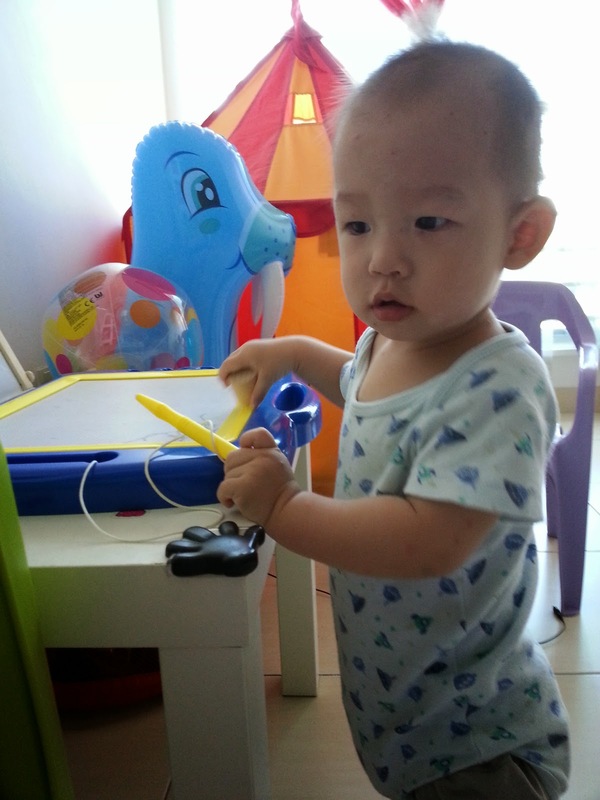 G is only 11 months, and he has already got his chicken pox, so there's no need for the vaccination already. Kenzie of course had his vaccination when he was 13 months, and the result were very significant. His pox size were bigger, but they came out and dried up very fast, like in a few days then kautim liao. G's poxes on the other hand dragged for a week already, and there are stil new ones til today. No porridge in the meantime as porridge will trigger fever. Oats or (blended) maceroni/pasta will have to do in the meantime. I feed him with oats/blended pasta with vegetable purees. Sometimes oats with Bovril. No eggs too. 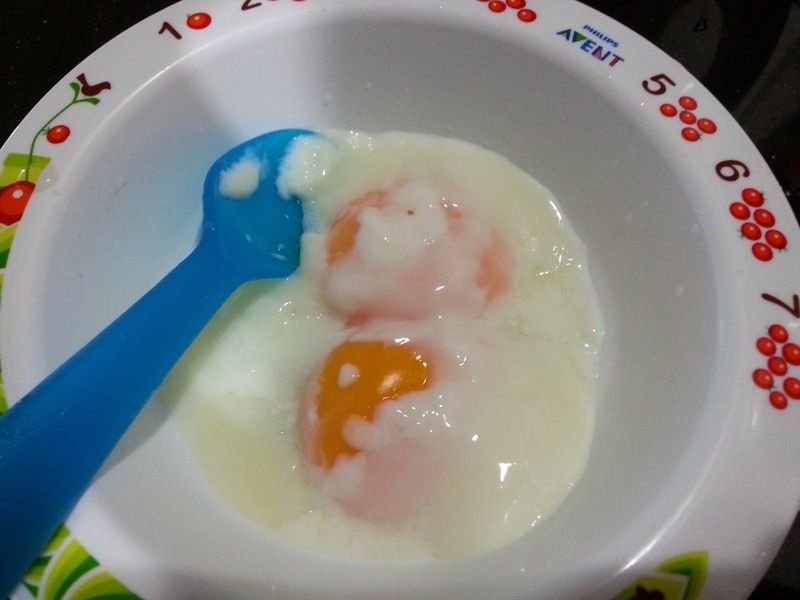 Ohh this is Kz's half-boiled eggs, I make sure the yolks are somewhat cooked and not too runny or raw. I think I had mine at very young age too!!! Morning, now only got chance to reply the comments, was on leave yesterday lor.. I got mine When I was 30 abs it's so tough ! Yeah, my boss got it at 40, from his daughter (who got it from school).. So you on leave to jaga baby? Nope, didn't cut his hair ahh.. First picture was taken on a Friday, second one taken on Saturday, third taken on Sunday. First picture: Hair up la, but maybe the picture is not clear. Second picture: That's his original hair. I never had Chicken Pox.... stay away from me please! So scary for older people to kena. Eh, once in a lifetime must kena ger wor.. How? The Mat Sallehs still eat everything when they have chicken pox and remained safe. Are we being too worried? I also not very pantang geh, but you know la, if G kena fever again, my mum will bising until I cannot concentrate in work.. So better avoid lor..
Oh dear!!!! Hope he's ok now. Have you had it before? It's contagious. They say even if one has had it before, one may end up with shingles - the same virus or whatever still in one's body even after complete recovery. Yeah, I heard of shingles.. From Rose's FB..
Hopefully.. G's recovery is much slower, coz the pox is out little by litle everyday, unlike Kz, 1 week kautim..
Yep, that's why yesterday whole day no tuk-tuk.. Only published my post nia..
i had my chicken pox when i was 8, and that was during the mid-year school holidays, ngam ngam 2 weeks i don't have to take leave from school.. and it's better to have it when we are young, because i heard you suffer more if you have your pox when you are older.. dunno true or not?? aiyoh, just 2 more months before G is getting his vaccination.. but then okay also lah, since he is still young and the chicken pox will get over pretty soon.. and you also jimat some money no need to spend on his vaccination anymore.. can use the money to buy G more toys to reward him for being a good boy during his "pox day" mah..
but looking at the photo, not too serious on G right?? and you also didn't complain him for merajuk because of the pox.. look, he still looks like "guai guai chai" in the photos and never throw tantrum at all mah.. so where got in a mess?? maybe you need to do extra blending of food to feed him only lah..
Wah, so long comments, longer than my post.. Hehehehe.. So happy la.. Yeah, I think the older you get, the pox will be bigger.. Like Kz.. His pox were much bigger and more "bloody", whereas G's pox were small tiny biji-biji, like mosquito bites only..
Yep, I said my life is in a mess now coz I take many days off liao from work this month.. You name it: MC, annual leaves, emergency leave, all applied this month. Yes, kids come first, and I don't give a damn about the boss (and work), but still, heart not feeling too good if always take leave lor.. And then, my mum keeps complaining everyday, hinting for me to get a nanny / change to a nearer-to-home job, etc.. Hou farn ahh..
Oh yes, I agree with you.. "kin pou hang pou" ma.. I plan to save all my leaves for year end geh, but since now I use up so many liao, no choice lor.. "kin pou hang pou" lor.. Paling teruk pun, unpaid leave lor, but I hope that will not happen la.. 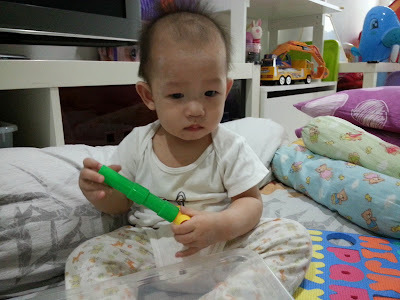 So "mm dai"..
Eh, G already kena high fever about a week before his pox showed up. But thank god, during his pox "season", no fever lor.. Mum is taking care of him, of course I don't want him to get fever or whatsoever, if not, she lagi bising until my ear drum pecah.. I remember my little girl got it first. Then followed up by her sisters and brother. It's better for them to get it when they are young. 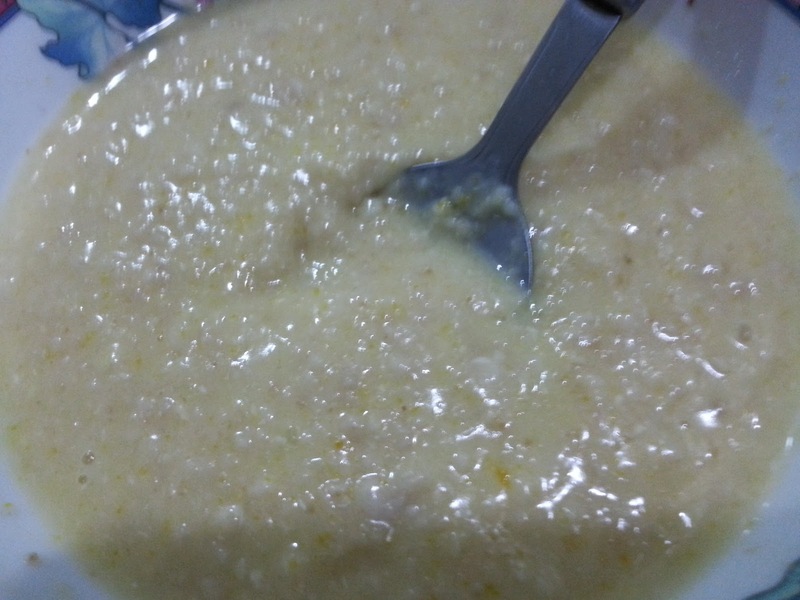 Porridge can trigger fever? I thought porridge helps to reduce fever, no? I always eat porridge when I have fever LOL! But I do know rice will make a fever worse. I asked mum the same thing. Usually sick people (fever) only eat porridge, but why babies cannot? Mum said rice or porridge got "mai hei", so better not. Even the pediatrician said avoid rice/porridge wor (for babies la, adults I dunno, but most of us still eat porridge when sick, kan?).. I heard that people can still get chicken pox a second time if their immune system is low. Also, those who have had chicken pox may get shingles later in life - it appears that the virus that cause chicken pox is the same as the one causing shingles. Yeah, STP mentioned too, people who got chicken pox already don't be too happy yet, one fine day MIGHT get shingles.. But meantime, one thing at a time lor.. "kin pou hang pou", been taking too many days off from work this month because of the boys' pox.. First Kz, then now G.. If you have any other blogger friends who has eczema or severe dry skin, please get them to contact us so they can try out Marine Elements too. We are still looking for real stories. Thanks for sharing reana.. I'm writing to her soon.. Not only for me, but for the hubs too.. He has some red patches on his head, it won't go away the skin specialist says, but it can be controlled with medicine and shampoo and creams and all.. Like you said, they are all steroids..
Glad that G is recovering well now... You must be feeling relieved. But I thought everyone must kena chic pox for once in their lifetime? You are immune to it, means your boy kena already, but you were (still) safe? Kekekeke..
My hubby and 8yo girl have not infected with chicken pox. Maybe strong immune system. Lol. Glad your boy is alright. My Jay had chicken boy when he was around 8 months old. Louiz Miss you lar...how are you today? masih on leave ka? Elo, elo.. No more on leave jor la.. Working liao lor.. Ok, will hop over to yours to say hi pulak, keke..
Why would porridge trigger fever eh? When I had chicken pox (at age 21YO ! ), it was really terrible and I ate everything, including dark soy sauce haha! Thank God, no scars, phew! Dunno leh, but my mum and other old folks say it's true... When a toddler is having fever, don't feed rice or porridge.. Anything made of rice (mai hei) will trigger the fever more wor.. But I also don't understand, coz when we are having fever, we always say "oh, can only eat porridge coz fever"..
Hope your boys are fully recovered by now.